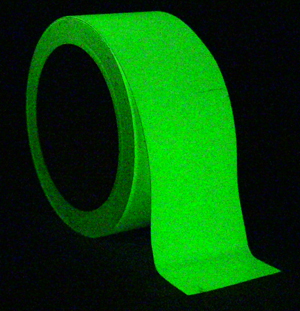 At Safety Direct America, we specialize in offering low, low prices on very popular glow-in-the-dark tape. Contact us online or call us directly at 1-800-988-6721 for great discount prices on our Jessup glow-in-the-dark products. Provides an excellent photoluminescence capability and can be recharged by natural or artificial sources. We can cut these tapes to any size or shape you require, with widths up to 46″. Standard sizes are 1in x 60ft and 2in x 60ft. These anti-slip tape products glow for about 20 minutes, long enough to evacuate a small building. These tapes are perfect for making stairs, exits, and evacuation routes anti-slip. These tapes are not anti-slip floor tapes but are for use as white, glow-in-the-dark photoluminescent egress tape markers on walls, baseboards, and thousands of other objects. Jessup’s Glo-Brite tape sticks to nearly any surface, glows for 24 hours, and can be removed cleanly when necessary. Take advantage of FREE shipping on order over $120. Shipping is FREE over $120!! These tapes glow for 24 hours. These tapes are not anti-slip floor tapes but are for use as white, glow-in-the-dark photoluminescent egress tape markers on walls, baseboards and thousands of other objects. We have unbelievable low prices for rolls of Jessup’s brightest Glo Brite© Glow in the Dark egress tapes that stick to nearly any surface yet can be removed cleanly. These include Jessup’s “high tack” glue, making them stick to more surfaces than bargain photoluminescent egress tapes. These glow in the dark egress tapes made by Heskins glow for about 20 minutes, just long enough to evacuate a small building. They are less expensive than the Jessup glow in the dark tapes (above), but glow quite brightly right after the lights go out, illuminating exits and whatever else you want to be findable right after a power outage. These tapes glow for about 20 minutes. Our photoluminescent material is natural, mined strontium aluminate that absorbs ambient light in minutes, then emits it, remaining cool when the lights are out. Its effectiveness lasts for well over a quarter of a century. It’s non-radioactive, so there’s never a disposal problem like with tritium-based material. Much brighter much longer than lead-based glow material. Zero energy cost — how “green” can you get?